New legislation could be the end of the modality. The radiology industry has been hearing the death knell for CR for what seems like a decade, but the cassette-based medium has persevered and remained the "little engine that could," even as more and more hospitals and health care systems have gone digital with DR detectors. However, with new rules set to take effect next year that will reduce reimbursement for CR exams, time may be running out for CR, as an increasing number of smaller health care facilities—CR's bread and butter as of late—are believed to be finally transitioning to DR.
"CR will be a declining product segment in the next few years, due to the upcoming reimbursement changes in 2018," says Ron Batory, Konica Minolta's product marketing manager of CR and conventional imaging products. When President Obama signed the $1.1 trillion Consolidated Appropriations Act of 2016, also known as the 2016 omnibus spending bill, last December, part of the legislation was designed to speed up the change over from traditional X-ray imaging to DR by implementing a series of Medicare reimbursement cuts that will be phased in over the next seven years. 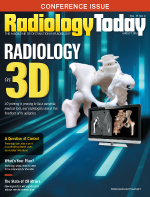 "Now that the 2016 omnibus bill has been enacted, the time is right for physician practices still using analog and CR imaging to make the switch to digital radiography for more efficient, higher quality X-ray," Batory says. The ACR reports that while the new legislation still permits physicians to continue to use X-ray equipment used for film radiography and CR, those who elect to do so will be subject to per-scan reimbursement reductions. Starting in 2017, claims submitted for X-rays performed on analog equipment will receive a 20% reduction in payment, and the following year, claims for X-rays performed using CR technology will be reduced by 7%. The cuts will increase to 10% beginning in 2023. "Our customers are asking for information about the omnibus bill and how we can help them make the best decision for their future imaging needs," Batory says. "They expect the same quality of performance and service from a new DR as they have received from their current Konica Minolta CR systems." Konica Minolta has no plans for any new CR products but will continue with its current line of Xpress, Nano, and Sigma CR products, which cover all market segments from private practice to enterprise hospitals, Batory adds. "We will maintain our current CR product line to continue to support those markets that are unaffected by the recent government [omnibus bill] changes in Medicare reimbursement," Batory says. "We have [also] recently launched a comprehensive advertising campaign for converting CR to DR—the Omnibus Invasion—which will educate our customers and direct any who are interested to our website for new DR product review." Rob Fabrizio, Fujifilm Medical Systems' director of strategic marketing, digital X-ray, and women's health, says CR has been experiencing significant declines year over year for the past several years, with last year being one of the biggest declines. Topped off with the announcement of the Consolidated Appropriations Act at the end of the year, things are not looking good for the modality, which Fabrizio thinks is unfortunate. "The size of CR readers has been getting smaller and smaller, with the latest models now the size of desktop printers. Additionally, the costs have come down significantly, making them very affordable for small private practices," Fabrizio says. "Because they are 'digital X-rays,' image quality and dose efficiency are excellent. CR remains a solid, reliable technology for price, and many private practices will be very disappointed to have to give it up." Siemens product manager Viola Fernandes says that, since December, customers have been trying to figure out the best way to move to DR, and that's been a major talking point throughout the radiology industry. "I do think it's a matter of time before all hospitals change over to DR, and it's a good move because there are so many benefits. It's the reason that all vendors do now have a DR solution," she says. "I remember in 2005, I talked about how in 10 to 15 years we would see a wholesale change into digital technology, and it looks like it is happening now." Sarah Verna, Carestream's worldwide marketing manager for X-ray solutions, notes that the company is still invested in CR technology and has seen numerous health care providers transition from larger, multiplate CR systems to smaller tabletop models such as Carestream's new Vita Flex CR system. "This compact system processes up to 45 plates per hour and can be positioned horizontally or vertically to offer a small footprint in clinics, physicians' offices, and other facilities," Verna says. "In addition to supporting multiple cassette sizes, the system also includes Carestream's Image Suite software for digital image acquisition and management." The Vita Flex CR system is the company's newest model in its CR portfolio, processing 30 to 45 plates per hour. It also eliminates the need for a service agreement. "It's designed as a compact, lightweight unit that addresses the needs of clinics and physicians' offices and can also be used for mobile imaging," Verna says. "This newly designed system consists of three field-replaceable units that can be installed by users. It's as easy as replacing a cartridge in a desktop printer, so, if there is a problem, a user can run diagnostic tests to determine which unit needs to be replaced and then install the new unit themselves." As providers upgrade to DR systems, today's CR systems are also being used as backup solutions that can be used as extra units on hand to ensure continuous uptime. Fabrizio notes Fujifilm is providing CR users professional sitewide consultations to help assess their specific needs evaluating current equipment, patient volume, and workflow to determine the best paths to meet their budget and workflow. "When transitioning to DR, [we help] them to scale back equipment while achieving higher exam volumes and other benefits in patient experiences and outcomes," Fabrizio says. "One of the biggest holdout areas for CR has been long-length imaging, and many of Fujifilm's customers are reluctant to give up their single-exposure long-length CR imaging for DR—until now." Fujifilm will soon be releasing D-Evo GL, the world's only long-length single exposure DR detector, which provides faster setup and has 40% to 50% lower dose than CR, when compared with multiexposure DR.
"Other features such as our patent-pending Hydro AG antibacterial coating on our D-Evo II detectors can help provide extra safety measures to protect against [health care–associated infections] for portable exams," Fabrizio adds. Siemens' Multix Fusion, which offers a higher table read capacity, was designed to have capabilities of both CR and DR systems; those using it for CR can upgrade to DR. The Multix Fusion, Fernandes explains, is comfortable to maneuver, so patients can easily be positioned. The detector can also be taken to where the patients are. For example, patients undergoing lower extremity exams previously had to stand on a stepstool, but that is no longer necessary. This makes the patients feel more comfortable and, in turn, makes the system easier for technologists to use, giving them the ability to do more exams. Verna expects the use of CR technology to decline in the coming years, but Carestream believes the technology will remain an effective solution for small clinics and orthopedic or general practice offices, as well as chiropractors and veterinary care facilities. "Being able to capture images in an initial office visit is more convenient for patients and also reduces costs," Verna says. "Customers appreciate the advantages offered by compact CR systems but are always looking for the most cost-effective solution for their facility." No doubt, all CR manufacturers will see a continued decline in CR opportunities and sales in the coming years. Despite diminishing reimbursements, Batory notes that Konica Minolta will hold steady in its current CR product offering to continue to supply all markets, including those unaffected by the forthcoming reimbursement changes, including veterinary, chiropractic, and other similar markets where new CR sales potential may still exist.